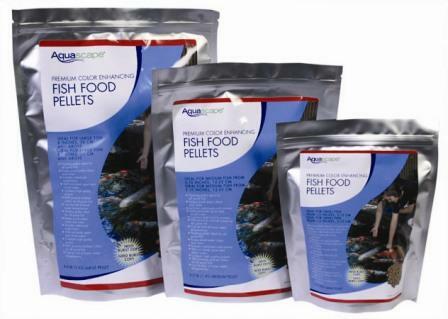 Fish Food - Cold Aquascape Premium Cold Water Fish Food Pellets have been scientifically formulated to provide premium nutrition to all pond fish including goldfish and koi at colder water temperatures. Fish Food - Color Aquascape Premium Color Enhancing Fish Food Pellets have been scientifically formulated to provide premium nutrition to all pond fish including goldfish and koi. Fish Food - Flakes The inclusion of plankton and shrimp meal help make this food irresistible to all pond fish and can be easily consumed by smaller fish including babies known as fry. 99339 This book will take you thought the diagnosis of fish problems and the associated treatments. Fish, like all creatures, need food to survive. 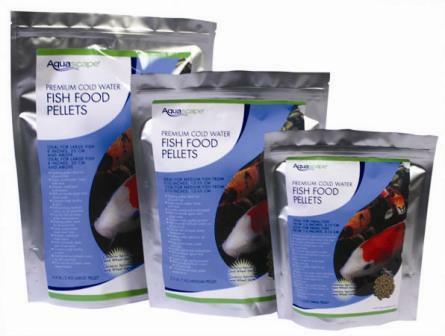 Aquascape fish foods are scientifically formulated to provide all pond fish with premium quality nutrition at a great price. Quality ingredients, including multi-vitamins and stabilized vitamin C, provide superior nutrition and will not pollute pond water. 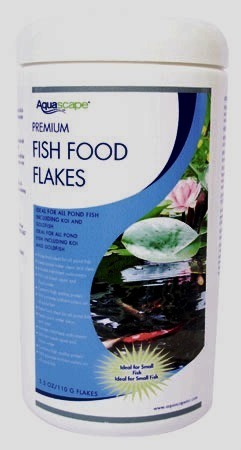 Aquascape fish foods are ideal for all pond fish including koi & goldfish. Feeding your fish is one of the most enjoyable times you will spend with your pond. It provides the oportunity to bond with, tame and train your fish. Always place it in the same place each time you feed you fish. This way the fish learn that when you are in this spot, it means they will be fed. Soon you can train them to eat out of your hand. Our pond fish require different types of foods for different seasons. During late spring and summer you should use a staple that contains higher amounts of protein. Protein is used by the body for bone and tissue growth. Fish, as in humans, do not store protein in the body. It is used for growth, however a small amount may be converted to carbohydrates. Carbohydrates are burned as engery for swimming. It is stored in the body as fat so it is essential that a lower protein content be used during cooler temperatures. Your fish won't have the benefit feeding on a regular basis during the winter. Therefore a wheatgerm based diet should be used so the fish can store carbs and fat for the winter. Fish will eat both animal and vegetable matter which makes them omnivorous. They do not have stomachs so they can't eat large amounts at one time. This is the reason your fish spend a great deal of time foraging around. Fish will actually eat just about anything that is small enough for them to swallow whole. The hand-feeding process can be pleasurable for both you and your fish or goldfish. Instead of throwing the fish pellets into the pond, take the time to place them into the water at the same area daily. In so doing, the fish will become accustomed to the routine and will, over time, become friendly and trusting enough to be hand-fed. Pond fish have even been known to recognize there owners' footsteps and follow them around the waters edge. Taming and training your pond fish is a gradual process, but it can be very rewarding. Spending this time with your fish will also allow you to observe any problems early on. Your fish should be fed one tenth of their body weight per day. A 12 inch fish weighs approximately one pound. If you have ten, 12 inch fish in your system you should be feeding a total of one pound per day. 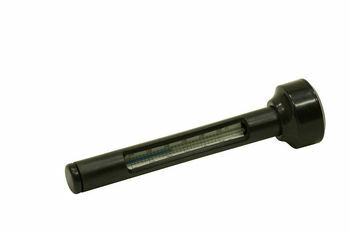 Make sure that your filter can handle the processing of that amount by checking your water quality regularly. ECOLOGICAL BALANCE. If you understand this basic fact, your water will always be clear, not green. FISH AND PLANT WASTE =PLANT FOOD=ADEQUATE PLANTS TO USE THE PLANT FOOD=BALANCE=CLEAR WATER. Over feeding fish, and/or not enough plants = green water 90% of the time. A Simple solution that doesn’t come out of a bottle: Understand balance, and you’ve got it whipped!! The Ammonia-nitrite-nitrate cycle is a fact of nature. Fish and plant waste (ammonia) get converted by bacterias into nitrite, which gets converted by additional bacterias into nitrate. Ammonia and nitrite in small amounts can be harmful, and even lethal, to fish. Nitrates, the final step, can be concentrated at much higher levels without being harmful to fish. If there are not enough plants to handle this additional nitrate, (plant food), LOOK OUT!! !, nature will supply it free gratis in the form of green water and/or string/filamentous algaes. In a balanced pond, these algaes will still be present, but in low enough numbers that you won’t even notice them without really, really looking. 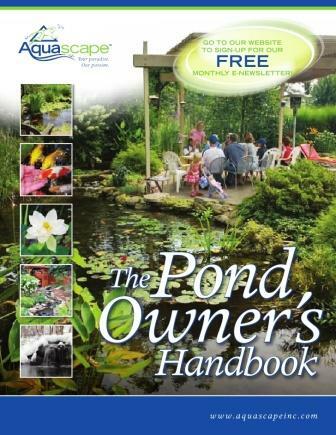 A mature, balanced pond will have literally no traces of ammonia or nitrites, only nitrate. As a result of this information, go slow with a new pond as far as putting in a lot of fish or feeding them a lot for the first month or so. Give it a chance to colonize these bacteria's in sufficient numbers to be able to mature and handle the pond’s biological needs, as well as letting the aquatic and marginal plants get established. Fish food ingredients labels can be very exciting, or very misleading. They can be exciting because they seem to report excellent ingredients and real care and attention in manufacturing. However, misleading labels use techniques like ingredient splitting and foreign law to dupe the consumer. Take a trip to the store and we shall assess a label together in nine steps. Assessment 1: Protein source. Look for fishmeal, squid meal, whitefish meal, anchovy meal, shrimp meal, blood meal, herring meal or other aquaculture protein as first ingredients. These are the best protein sources for fish. Assessment 2: Ingredient splitting. Look for any ingredient twice on the list. If you were manufacturing a food and found wheat to be cheaper than fishmeal, you would want to use wheat to save money. But, you know the consumers want the fishmeal to be first on the list. So you split the wheat! Here’s an example: A fish food that has three pounds of wheat and two pounds of fish meal would have the ingredients listed in order by weight. To get around this, the manufacturer splits the wheat in half and lists it as two different forms of wheat. So that label reads fish meal, wheat germ, and wheat flour (in that order). This makes it appear to the consumer that the food contains a higher amount of aquaculture than any other ingredient. Assessment 3: Protein percent. Let's say a company who is tailoring a feed to the prevailing market-climate wants to use four aquacultural proteins, and tosses in shrimp, kelp, spirulina, and squid meal. That would be awesome! But it could jack up the proteins to a level unsuitable for fish, or at least unnecessary (and expensive). Koi can't digest more than 32 to 36 percent protein in one pass. Feeding more than that isn’t necessarily a bad thing because fish will simply pass what they don't digest – it’s just expensive to pay for a fish food unnecessarily high in protein. So, look for minimums and recognize that an outrageously high protein percentage is more than what’s needed. Assessment 4: Fat content. Find a food between 3 to 10 percent crude fat. The high end of this range is good for smaller fish, and the lower end of the range is good for adult fish. Assessment 5: Ascorbic acid. Make sure ascorbic acid, or L-Ascorbyl-2-Phosphate is on the label among the trailing ingredients. It will represent a very small part of the diet but it should be added to any milled food. Assessment 6: Immune boosters. Some foods are made with immune boosters. These are certainly harmless and they may very well perform as promised depending on which ones we're talking about. Look for any combination of the following supposed immune-boosting ingredients: Optimun, Aquagen, Nucleotides, Torula Yeast, Brewer's Yeast, Bee Propolis, Colostrum, Aspergillus niger, beta carotene, lactoferrin. Don't hang your hat on any particular ingredient as a miracle supplement or lifesaver, Just recognize that the addition of these items represents the manufacturer as a little more attentive and knowledgeable, and the food worth a little extra money. Assessment 7: Color enhancers. Are there color enhancers in the diet? Look for terms like Spirulina, Bio-Red, BetaCarotene, Canthaxanthin, Marigold petals, Xanthins, Shrimp Oil, Synthetic and Non Synthetic Carotenoids, or Color Enhancers on the label. Generally, the shrimp oil is the most expensive. It performs as well or better than the synthetic carotenoids but either is acceptable. Spirulina cannot push color unless the fish are exposed to sunlight. None of these color enhancers are hazardous to fish but can make a fish with a yellow head more yellow or a fish with a tendency towards pink pinker. No color enhancer can replace the irrefutable contribution of genetics and sunlight to color. Assessment 8: Ash content if stated. Sometimes companies will level with you and tell you the "crap" content of their food. Ash is what's left behind when you incinerate (or the fish digests) the food. It's almost all carbon and mineral. So the higher the ash number, the less likely one is to appreciate it. Generally, when ash is high, a smart label guy would just leave it off, and they are allowed to because it's not required on fish food bags.